Duncan Aviation team members exceeded collection expectations and an additional truck pick-up had to be scheduled. 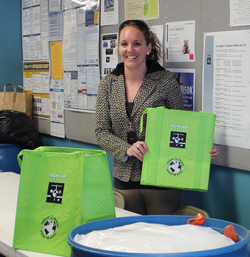 Kaela Paseka hands out insulated grocery totes to team members donating clothing. Four years ago Duncan Aviation brought a group of team members together from all across the company with the goal of researching and implementing "green" initiatives that will save energy and money, reduce waste and give precise focus to innovative efforts, as well as strategic priorities. As a group, they wanted not only to impact change while at work, but also to encourage change in the daily lives of all Duncan Aviation team members. Their message is that even small changes can have a large impact. 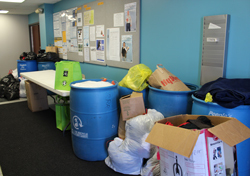 Recently Duncan Aviation’s Green Team organized a clothing recycle drive for the People’s City Mission Homeless Prevention Center of Lincoln, Nebraska. The drive resulted in two truckloads of donated clothing. Generous team members cleaned out their closets and brought in one or more bags of clothing in exchange for a Green Team insulated grocery tote. It is estimated that 175 Lincoln team members, or roughly 15% of the Lincoln location’s work force, participated in the event to support the homeless in Lincoln’s community. In fact, team members exceeded collection expectations and an additional truck pick-up had to be scheduled during the first day of the event. All donations were welcomed. Clothing that isn’t fit to be worn was recycled and any money earned from that recycling will be used to cover operational costs for the Homeless Prevention Center. This year Duncan Aviation's Green Team is devising a plan to remove Styrofoam cups from break rooms and to continue to provide education to team members on how to go green, find recycling locations, track down donation sites and brush up on recycling facts.